Skyrim SE, Windows 8.1 64 bit, Nvidia 980 Ti drivers current, no overlays, no other loaders. SSE running at Ultra settings and using DSR at 3413x2133 on a 25460x1600 display. Trying to troubleshoot, so RS 3.0.4 is a stock install with no preset. 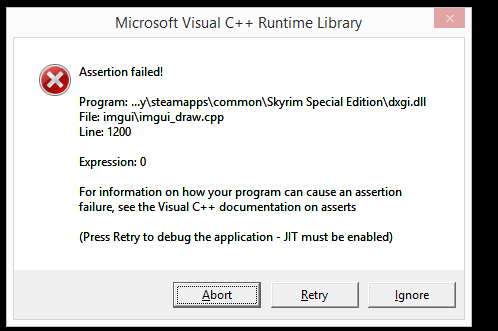 Retry CTDs, Ignore loads SSE and RS 3 but Shift-F2 CTDs the game. Any help appreciated and if you nee more info, let me know. You are missing the Consolas font, which normally is part of Windows (C:\Windows\Fonts\consolab.ttf). I should check for that and use some fallback instead of crashing though. I'm a graphic artist and activate/deactivate fonts all the time. However, the real problem is that I think have a newer version of Consolas Bold (Consolas-Bold.ttf, not consolab.ttf) which (i think) came with MS Office and deprecates consolab.ttf. Downloaded consolab.ttf from a github repo and replaced my version with that one. Success!